Dual-line systems SKF EasyRail High Pressure transport compressed air and the lubricant in separate lines. The lubricant is metered inside the spray nozzle directly. The system pressure can be up to 100 bar. The lubricant is metered inside the spray nozzles (typically 0,03 or 0,05 cm³/spray). It is applied with high accuracy onto the wheel flanges with a pressure of up to 10 bar. 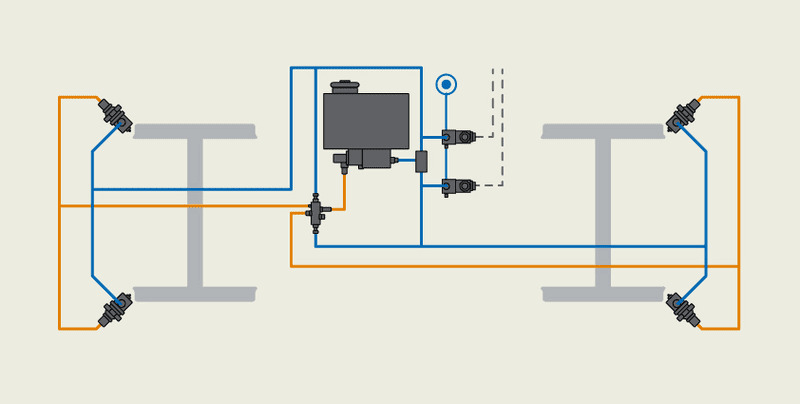 The high system pressure allows system designs with maximum line lengths of 10 m between pump unit and spray nozzle. With suitable lubricants, the system features enable save lubricant application at extreme speed and/or environmental conditions, like low temperatures (down to -40 °C). The SKF EasyRail High Pressure system can be customized as a centralized lubrication unit for bi-directional operations. Therefore it is the preferred solution for lubricating the wheels on the leading axle of locomotives. SKF EasyRail HighPressure systems are mainly used on large locomotives, high-speed trains with power heads (example layout). Other applications requiring a lubricant reservoir bigger than 7 litres, like tram cars to lubricate wheel flanges and back-faces by appropriate quantities, may be considered. Directing the nozzles to the top of rail to apply friction modifiers is possible as well.